The sperm whale is the largest among the toothed whales. They have a large box-like head with small eyes. In fact they have the largest brain of any animal on earth. Their thin lower jaw contains all 50 of their teeth which are each the size of a fist. It is not a very fast swimmer but dives to extreme depths of a mile in its search for giant squid. When diving they usually show their flukes. A sperm whales head contains a milky-white substance called spermaceti which was originally mistaken for sperm thus resulting in the whales name. This substance is thought to help the whale regulate its buoyancy. They have only one blow hole located on the left side of their head. The stream from the blow can reach 50 feet in height. Females give birth to calves once every 4-6 years. These calves weigh one ton and are about 13 feet long at birth. Gestation period is 12 -18 months. The calves can swim on their own within 30 minutes after birth. Mothers use echolocation to keep track of their young when they dive for food. The young need to breathe more often and cannot dive as deeply. 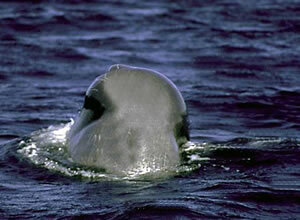 Gregarious females stay in pods of about 12 whales which also include the young. Young males leave these pods when they are between 4 and 21 years old to join small bachelor pods. As males get older their pods get smaller with the oldest males usually preferring a solitary existence. The pods containing female and young sperm whales stay in the more tropical waters whereas the male pods migrate north from spring through fall, heading back to the tropics to breed. Sperm whales eat about 3 percent of their body weight in giant squid, octopus or demersal rays each day. That's about one ton! Their prey is found in deep, dark parts of the ocean therefore the whales utilize echolocation to hunt and track their prey. Sperm whales and giant squids are thought to be mortal enemies as suction cups shaped scars are often seen on the whale and parts of giant squids found in their stomaches. Whalers continue to hunt and kill sperm whales today for oil and ambergris found in a whale's stomach. Ambergris is used in perfumes and is very valuable. In spite of this whaling activity the populations of Sperm whales remain strong today. Weight: . Males up to 50 tons; females 20 tons. Travel speeds: 23 miles per hour. Typical submersion times: as long as 1 to 2 hours. Diet: Primarily squid and octopus. <strong><a href="http://www.whale-watching-alaska.com/whale/spermwhalesalaska.html">Alaska Sperm Whales</a></strong>: Explore the watery world of the Sperm Whales of Alaska! Information about the location, strength, and overall health of the species in Alaska.